On Monday, Nov. 12, the annual Veterans Day program will be held at the Gettysburg School Gymnasium beginning at 9:45 a.m. The program is sponsored by the Gettysburg VFW Post 8530 and the American Legion Post 135 and will be followed by a potluck at the American Legion at 11:30 a.m. The program is being held at the school so the students may attend. The Avenue of Flags will be raised at the courthouse on Veterans Day, Sunday, Nov. 11, which will be followed by a free-will breakfast at the Legion around 8:30 a.m. The public is invited to the breakfast to meet the veterans who have traveled from around the country to participate in this year’s national Decorated Veterans Hunt which is hosted by the local VFW. During Monday’s program, the school band and chorus will perform, and GHS students will be reading selections. The key note speaker will be the VFW National Senior Vice Commander. Honored guests will be members of the Disabled American Veterans who are part of the national pheasant hunt taking place in Potter County this week. Veterans from the community will also be honored with presentations of Quilts of Valor. Made by area quilters, the Quilts of Valor are presented to military personnel who have been touched by war. Lynn W. Rolf III was appointed Director of Programs in September 2015. Prior to coming to the VFW, he was employed by Northrop Grumman Technical Systems. Rolf served in the United States Army for nine years as a military police officer. Among his assignments, he served as company commander of the 300th Military Company, and deployed in 2003-04 in support of Operation Iraqi Freedom, within the Sunni Triangle and MSR 1. His numerous decorations include the Bronze Star. He received his bachelor’s degree in sociology from Pittsburg State University prior to commissioning as a second lieutenant in 1997. He also received a master’s degree in business & organizational security management from Webster’s University at Ft. Leavenworth, Kan. Rolf is a third generation VFW member and his younger brother is currently serving as a U.S. Army major in the Kansas National Guard. He has served in elected and appointed positions at the Post, District and Department (state) levels culminating with his election as Department commander 2013-14 and Western Conference Chairman 2015-2016. He achieved All- American status as a District and Post commander. He has served on the National Security Foreign Affairs Committee, National By-Laws Committee and the National VFW Iraq/Afghanistan Committee. He was appointed National Aide-de-Camp in 2008-09, and National Deputy Chief of Staff in 2009-10 and again in 2010-11. He is a life member of the Military Police Regimental Association, a Master Mason and member of the Military Order of the Cooties, Ducks Unlimited, Pheasants Forever and a board member of Patriot Outdoor Adventures. He was inducted into the White Castle Cravers Hall of Fame Class of 2015 and was named the 2011 Leavenworth County Humanitarian of the Year. 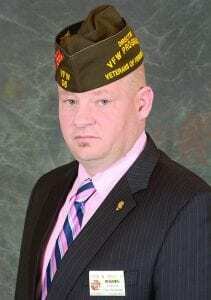 Rolf is a Gold Legacy Life Member of VFW Post 56 in Leavenworth, Kan.
Rolf resides in Leavenworth, Kan.